Now that you have decided to go hunting for the Northern Lights with a professional guide rather than chance it on your own you are faced with the dilemma of which tour to choose. There are as many tour options as there are different needs of the hopeful Northern Lights hunter. We wouldn’t say one tour is better than another but one might definitely suit YOU better than another. 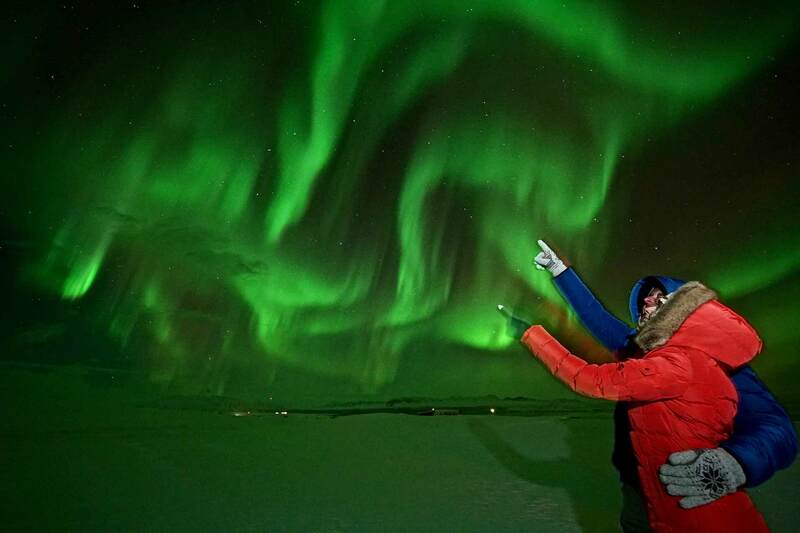 To help you choose the right Northern Lights tour FOR YOU we have come up with a list of pros and cons. Now, all you have to do is figure out which of the pros are important to you and which of the cons are worth putting up with. Free re-run in case of a non-sighting: Most tour operators offer a free re-run if they don’t find the Aurora Borealis on your tour. Some will offer one free re-run, some unlimited. Some will have a time limit and some not. Private tours and combo tours tend to not offer a free re-run. If photos are included: This varies. Some tours include photography as part of the experience and some will assist you with setting your own camera. You can also find professional photography tours. If you want to use your own camera read our guide on How to Photograph Northern Lights first. When the tour starts and ends: Most Northern Lights tours start between 20:00 – 22:00 and finish at 00:00-02:00. If you have some time restraints on either end make sure that it fits your chosen tour. Pick up locations: Buses, minibuses and monster trucks can not pick up from certain areas in Reykjavik city centre. There will always be a bus stop close by though. Others can pick you up from your doorstep within the center of the city. If group size matters: Choosing a smaller vehicle doesn’t guarantee a smaller group on location. Some tours like to travel in a convoy while others like to be exclusive. Off roading experience: Choosing a Super Jeep or Monster Truck doesn’t mean they’ll go off-roading necessarily. Some like to have the big wheels to be able to go off road when and if needed to find the Aurora Borealis while others bounce around mountain roads for an extra experience. Northern Lights tours are normally categorised by the type of vehicle they are operated on. Group size, flexibility, location and price are all dictated by the vehicle. The big buses generally carry 40-60 people and are budget friendly. Super Jeeps carry 6-8 people, Monster Trucks take 10-14 people, and are not budged friendly. Minibuses take up to 19 people and are mid priced. The big bus moves slowly and can’t chase the lights. The Minibus can move around more quickly but is limited to good roads. The Super Jeeps, Monster Trucks and modified 4×4’s can change location quickly and traverse paths in difficult conditions but the ride might be bumpy. Pros: Warm, comfortable, easy to get in and out of, children normally go free, normally have WC facilities. Cons: Big group, limited in location choice, possible crowds on location, limited access to guide, limited pick up locations. Pros: Small group (unless convoy), get off the beaten path, flexibility in location, good access to guide, can pick you up from your doorstep (except Monster Truck). Cons: Can be a challenge to climb in and out of, can be uncomfortable (esp. if you have health problems), no WC facilities. Pros: Smaller group than a big bus and cheaper than a Super Jeep/4×4/Monster Truck tour. Cons: Limited pick up locations, no WC facilities. Pros: Warm, inside lounge area, bar, WC facilities, sailing experience. Cons: Not good for taking photos, very limited location choice, possible seasickness. Pros: Unique experience under the night sky even without the Northern Lights. Cons: Limited area, no inside shelter close by, no WC facilities. There are many different combination tours to choose from. You can also make your own combo by finding a day tour that finishes in time for you to catch your Northern Lights tour. Pros: Good use of time. Value for money. Cons: These tours are not cancelled when the Northern Lights forecast isn’t good, limited to a location, normally no free re-run. We hope this helped and that you now have a decent idea of which kind of tour to choose. Happy Northern Lights hunting!